Hi everyone, I have a question about a silver cup my husband has inherited. It has been handed down through the male side. 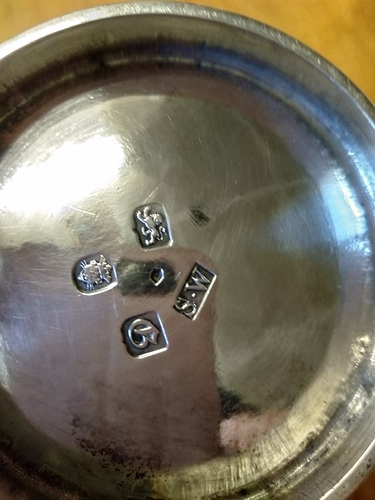 The family fled from France to England in the 1850’s, however the hallmarks lead us to believe it is English silver from early 19 century. My mother in law had an antique specialist look at it many years ago and he was convinced it was from much earlier around 1600’s. It is in fact pretty much in the middle of your possible dates. This is a London hallmark for sterling silver with the date letter G for 1762. The maker is Samuel Whitford (normally designated as Samuel Whitford I because there have been 2 of the same name). Thank you so much Phil. I had a feeling it was Samuel Whitford but I couldn’t quite make it out as a G (I thought it was a B). Just not sure how it would have got to France? The letters engraved on the front (LP) tie in with the surname. Will have to try digging a bit deeper for the first name. Could it have been sent from England to France at that time, or maybe the engraving was done at a later date?